Alia Farid, “A composite image of Princess Diana’s anticipated visit to the Kuwait National Museum,” 2014. Commissioned by the National Council for Culture, Arts and Letters, Kuwait’s pavilion at the 14th International Architecture Exhibition of la Biennale di Venezia will take place from June 7 until November 23. Housed in the Arsenale, Acquiring Modernity is Kuwait’s second participation after Kethra, which debuted at the 13th International Architecture Exhibition in 2012. Under the supervision of deputy commissioner Zahra Ali Baba and the creative direction of artist-curator Alia Farid, Acquiring Modernity will address the exhibition’s overarching theme of 100 years of modernity from 1914 to 2014.The pavilion will explore symbols of modernity in Kuwait’s architecture, with a special focus on Michel Ecochard’s Kuwait National Museum, designed in 1960 and completed in 1983. 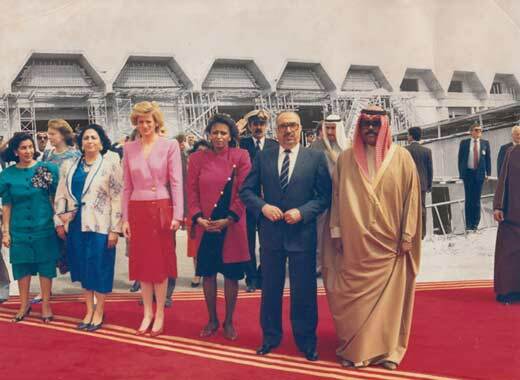 At the inauguration of Acquiring Modernity, participants will restage the celebratory opening of the Kuwait National Museum in 1983. During the rest of the six-month exhibition, they will continue developing their investigations regarding the role of the museum and the rehabilitation of its programs. Kuwait’s participation in Venice is only one moment of visibility from a larger project that aims to restore rigorous cultural involvement in the country. Representing Kuwait at the Biennale Architettura 2014 is a team of 21 individuals engaged in diverse areas of research: Aisha Alsager, Dana Aljouder, Sara Saragoça Soares, Hassan Hayat, Nesef Al Nesef, Noora Al Musallam, Amara Abdal Figueroa, Gráinne Hebeler, Abdullah AlHarmi, Samer Mohammed, Nima Algooneh, Liane Al-Ghusain, Adel Al-Qattan, Wafa’a Al-Fraheen, Dalal Al-Sane, Noura Alsager, Maysaa Almumin, Cherihan Nasr, Fatema Alqabandi, Alaa Alawadhi, and Ghazi Al-Mulaifi. The pavilion will also feature collaborations with filmmakers Shakir Abal and Oscar Boyson, graphic design duo Dexter Sinister, and artist Abdullah Al-Awadhi. Accompanying the pavilion is a research publication available in English and Arabic, a film set for release in November, and a joint installation with the Nordic Pavilion.